About a year ago, I created Flyball Prop-a-Ganda and kicked things off with a manifesto about how nobody seemed to care about Flyball anymore -- Flyball with a big "F," that is. I talked about how things had become very cliquey and regionalized, and how the only marketing plan NAFA or U-FLI seemed to have was to host a big national tournament and hope for some media fallout from it. I still feel that way about the two flyball organizations (although kudos to NAFA for getting flyball noticed by the Guinness Book of World Records), but I was wrong about nobody caring about marketing the sport. In the past year I've talked to many of you (at tournaments, via email, and on Facebook), and read your flyball-related Facebook posts and your comments on this blog and others, and I've come to realize that flyball competitors are constantly marketing the sport to others, whether it be through demos, Livestream videos, YouTube, classes, tournaments, articles in magazines and local newspapers, etc. It's all done at the grassroots level so it's hard to see it sometimes, but it's going on every day around the world. I have really wanted to see something happen at the NAFA/U-FLI level. But I've also realized that whining about it on this blog isn't really helping much. So this summer I wrote a flyball book. It's about 42,000 words (about 140 pages without photos). I wrote the book with beginners in mind. I wanted people who were interested in flyball -- who saw a flyball demo, or flyball on TV, or one of your Facebook posts about flyball, or an article in the local paper -- to be able to go to Amazon or barnesandnoble.com, type in the word "flyball," and find a timely book that would guide them through the process of finding a flyball club (or starting their own) and training their dog how to play. Lonnie Olson's book Flyball Racing: The Dog Sport for Everyone, was published in 1997. We all know that a lot has changed since 1997. We have new training methods, a new flyball organization (U-FLI), new/revised rules of racing, better equipment, designer breeds like Border Jacks and Border Staffies, technology advancements, social media (Facebook, blogs), etc. Right now the only way a newbie can find all this information is to spend hours on Google. This summer, I reached out to a prominent dog book publisher and they were interested enough in my proposal to request the full manuscript of my book. We chatted back and forth for a few months and one of their editors suggested some changes to my manuscript, and then in November they told me that they liked the book, but they weren't willing to take a chance on it at this point because they didn't think there was a big enough market for a flyball book. They said they would prefer to throw their limited resources at a project that was more of a sure bet, money-wise. They suggested that I either self publish, or resubmit the book to them in 2011 when they may have more resources to work on it. I'm choosing to self publish, and I'm choosing to take the whole thing to the flyball community in the form of a Flyball Book Project. 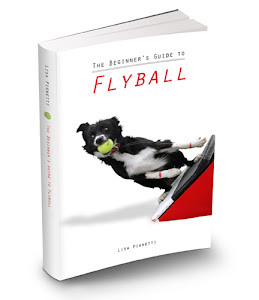 I think the publisher is wrong -- I absolutely do believe there's a big enough audience for a modern-day flyball book. But I don't blame the publisher for thinking otherwise, because flyball is not on their radar. They pretty much told me that. They talk to dog people every day, year in and year out -- their entire business is built on dogs -- and they said they just don't hear that much about flyball. So over the next few months, I'm going to be talking about the book a lot on this blog. I've decided to go ahead and self publish it for several reasons. One, because I don't want to keep delaying the book for months or years while I tried to convince a publisher to take a chance on it. Two, because I really like the freedom that comes with self-publishing -- I can now get all of you involved and solicit your tips, quotes, photos, etc., without outside editorial interference. I can make this our book, not just my book. I would also like to contribute a portion of the profits to a dog-related charity, so we're helping others in the process. I have a few charities in mind but would love to hear your suggestions. So what's the plan, and what do I need from you guys? The goal of this book is to to help newbies get involved with the sport. Maybe we'll help each other with this book, too -- there are hundreds of different ways to train a flyball dog, and in 11 years of competing I feel like I've only scratched the surface. Sharing training ideas will be really cool. This will be an agnostic neutral (thanks, Andy, for setting me straight on my use of "agnostic" -- see it's a group effort already!) book when it comes to NAFA and U-FLI. Both flyball organizations and their rules and styles of racing will be covered equally. For the next few months, I'm going to be posting topics and excerpts from the book, and soliciting your feedback. I need you to point out what I've missed, and share your own successful tips or training methods. If I write specifically about your idea in the book, I'll give you credit for it. I'm also going to be soliciting your photos -- I want the book to be full of them. Photos really help when it comes to explaining training methods, plus no words I write will ever come close to describing the joy and energy of a flyball dog the way a great photo can. I want the book to feature dogs and people from all over North America (or hell, the world -- bring it on, Germany, Japan, Australia, the UK, etc.!) and both North American flyball organizations. I will put your dog's name, your name, and your club's name in the photo caption of any picture that appears in the book. I have already spoken to photographers Len Silvester (http://www.ttlphoto.com) and Willie Moore (http://www.wmconsulting.com) about including their photos in the book, and they have both been amazingly gracious and supportive. They will allow any of their photos to appear in the book free of charge (and I will pay them $5 per photo to cover any cropping/touch-up work they'll need to do to make it a print-quality image). All they are asking for in exchange is a photo credit for each of their images that appears in the book. So if the photo you want to send me comes from either one of those guys, you're already set. If it's from another photographer, we'll have to talk to them to see what their requirements are. I'll do my best to work with everybody. Every time I post about a topic/excerpt from the book, we can brainstorm about great images to go with that section. 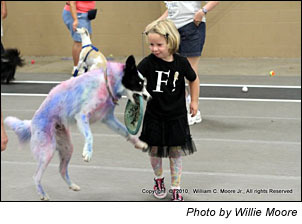 Photos of you guys training your dogs at home or at flyball practice will be welcome, too. I also have included an appendix in the back of the book that lists where to find (or how to make) flyball boxes, jumps, props, ring gating, and other flyball-related stuff. Let's make it a really comprehensive list. You know, getting rejected by the publisher was probably the best thing for this book. If I had written it all by myself, with no input from the flyball community, it would have had a narrow perspective on things. Together, we can make it great. You guys think about all this, and how you'd like to contribute (advice, photos, products for the appendix, etc. etc.). Also, let me know if you have a suggestion for a dog-related charity to donate part of the profits to. Look for a blog post in the next couple of days with the first book topic and be ready to send me your feedback. I'd prefer you do it in the comments section of this blog so that everybody can see it, but if you're shy, you can email me directly at xterrier @ gmail . com (no spaces). Wow! I think this is absolutely fantabulous news. I'm very excited! EEEEEEE!!!! Love it, can't wait! This is such an interesting project - I'm looking forward to seeing how it turns out! Since I'm based in the UK, would it be ok for me to crosspost this to Flyball Fever? (flyballfever.co.uk) I know that a lot of our flyball fanatics would be interested in this, and we have a couple of photographers who I think would be happy to donate some of their photos. I am looking forward to reading this blog in the coming months and to getting my hands on the finished project. Way to go Lisa! Yay! I think it sounds great. I hope you can gather some photos of various breeds and mixes (Erin's wiener, Kim's poodle, that Keeshound that plays for a bucket of chicken, etc.) to show people that all dogs can do flyball. I love having the kid pictures showing what a family sport it can be, and make sure you put some hotties in there. We need more hotties in flyball. Seriously, though, I wish you the best with your book. I think it is well written and enjoyable to read! I will help in any way I can! YAY. This is awesome Lisa. I can't wait to read your musings, etc... And I would be glad to send a pic of Aspen. I have some nice ones from Sam Bennett and he is usually willing to since he recently gave permission for pics of Aspen for the Poodle Magazine. So when you are posting your first section? Thanks, everybody!!!! I'm so excited about getting this project started. Kim, hopefully i'll have the next post up by Monday. Leanne, of course feel free to crosspost this to Flyball Fever. Kristie's comment above made me realize that I forgot to thank her, Kate Corum, and Sarah Proctor for reading the first draft of the manuscript and helping me get it to the point where it is today. They had so much good (and funny :)) advice. Thanks, guys. I hope Greer doesn't wear that T-shirt to school. Sounds like a great project. Looking forward to hearing what specific types of contributions you might want, and when we can order a copy. Good thing Andy corrected you, since one meaning for agnostic is "without knowledge". This is awesome news! I was so excited when I first heard about Flyball, but then completely bummed because all I could find in the library about it was one book! There were 15 on Agility and many more on Obedience. I devoured that book, but always wanted more. Lisa, I can't wait to buy/read it. 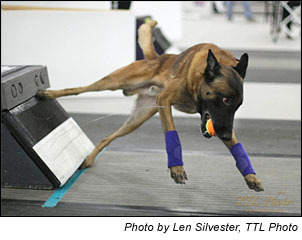 As someone who trains unusual breeds for Flyball, I would love to see a book with pictures of more than the "normal" breeds and with all different kinds of training techniques discussed, those for driven dogs and the not-so-driven ones. VERY EXCITED! What a great idea! @Pete, that's Gia. She hasn't worn it to school yet, or Sunday school for that matter ;). Sweet! Lonnie's was the book I read when I first heard about flyball. So much has changed and I think your book will really fill a need with new comers...yeah! Are you interested in gathering input from totally-brand-new folks? There is a new group of flyballers here in Alaska who are coming into it without any preconceived opinions and are looking at flyball with a fresh perspective. I'll post your project to the group and maybe they'll also want to help. This is excellent! I only got involved with flyball last January, and there really isn't that much good information out there and easily accessible. Having a book to point interested parties to would be a blessing. Hi Lisa! Congratulations! It's great to hear it! I'm trying to bring flyball to Brazil but with the difficult to find any material about it, nobody here has too much interesting. If you publish the book it will be a dream coming true for me. Did you think about to publish it as an e-book? Maybe it would be easier. Awesome! I love what you've posted and can't wait to read more. (is there more?) If you want some pictures of the sharpei with the swimmer's turn I can get you some. :) made my heart smile to read that, thanks! I know I have some from Sam Bennett and from a few others, too.